1. Using the small nail, tap a hole in each end of the raw egg. Make sure one hole is bigger than the other. 2. Blow into the smaller hole to blow the raw egg out of the shell. 3. Place the egg shell into a sink of warm water and allow the egg to fill with water. Gently shake water around in the egg shell. Blow water out of the shell as you did before. This step can be repeated if you feel it necessary. 4. Place egg into the over and bake for 20 minutes @ 250. This dries out the egg shell and strengthens it as well. 5. Allow egg to cool completely. 6. 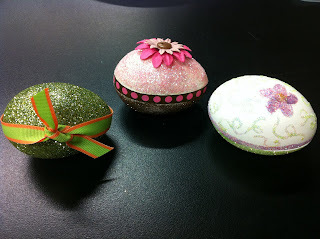 Use foam brush to paint egg shell with Mod Podge. Let dry. Repeat if desired. This step is vital in giving strength and durability to the shell. 7. Use the dremel tool and disc sander to cut your egg open – long way. Cut from hole to hole. 8. Measure around the cut edge of one of the egg halves. Add ¼” to your measurement. 9. Cut a strip of paper, ½” wide X egg measurement above. 10. Place a piece of 1/8” double sided sticky tape to one edge of your cardstock strip. 11. 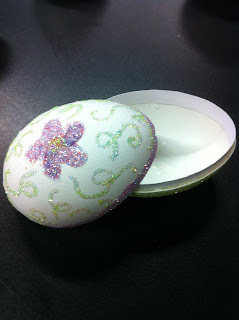 Adhere cardstock to the INSIDE of one of the egg halves. Make sure that ½ of the strip is ABOVE the cut edge. 12. Paint and decorate egg halves as desired.